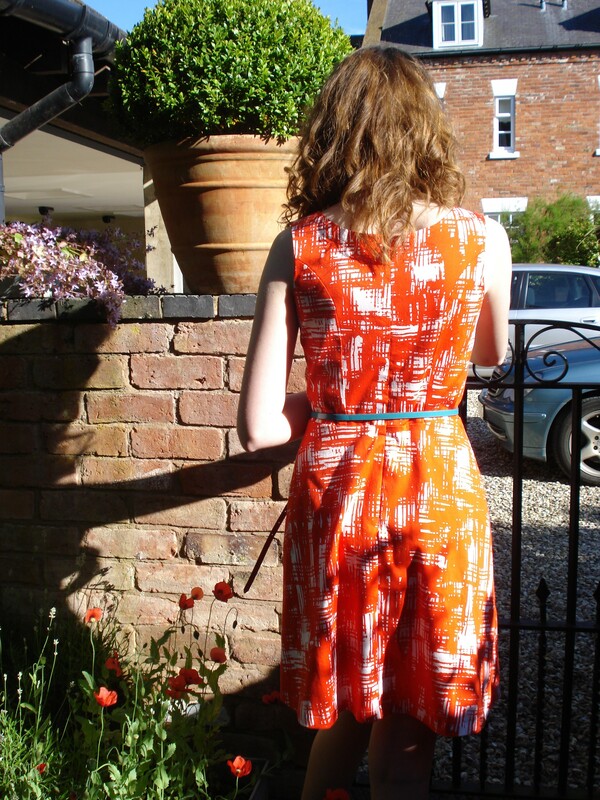 After a 24 mile round trip I have a red invisible zip, and now a completed dress! I am also definitely ordering a stock of zips from Jaycotts. I paid £3.90 for a 52cm long invisible zip! That’s madness!! 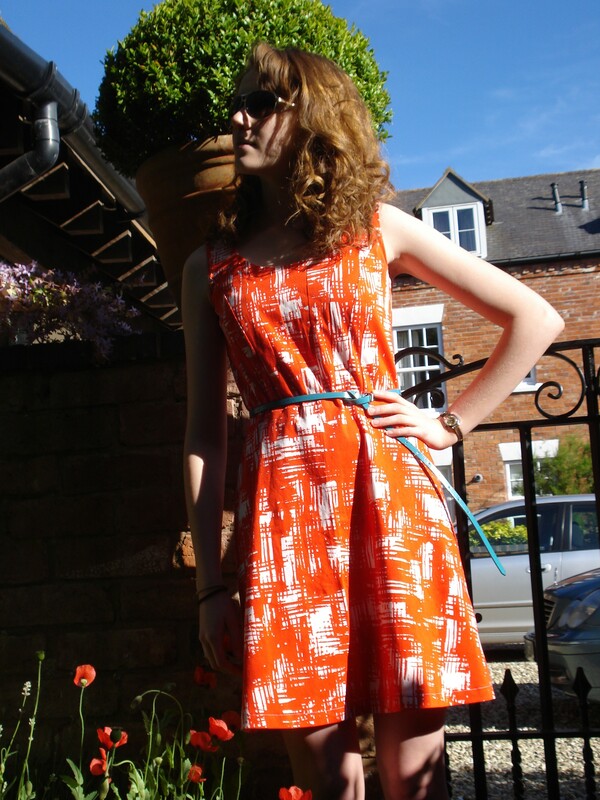 Anyway, rant over, here’s the completed dress, and a happy Daughter No2 in the sunshine to show it off. We love a little contrast, this turquoise belt is great with the red. The panels work really well, tailoring the bodice to her shape. The stretch cotton has a tendence to, well, stretch. So the lining is a stretch cotton poplin, with much less movement to keep the whole thing together. Why can’t we have more sun? Everything is so much better for it, including these pretty poppies. The back was kept simple. There is just one seam, I really don’t think it needed any more than that. The back is simple, just two panels! 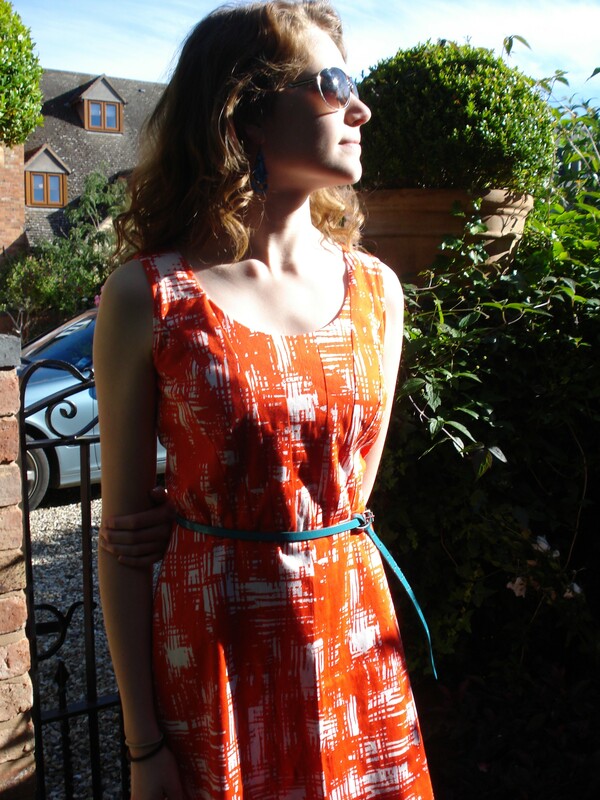 For some extra info, this dress was cut from the 2-piece dress block (from Winnifred Aldrich’s Metric Pattern Cutting) and adapted to the sleeveless block. Next time we’ll have more fabric to play with, and will make a fuller skirt. For now though, Daughter No2 is very happy with her new dress. Will the weather gods please let us have some sun so she can wear it?? Ouch on the zip! But your daughter looks amazing in the dress and it came together very fast. I love the turquoise against the red! Thanks. The contrast works really well, doesn’t it? Really cute! I love this dress! Thanks, a stripy bias cut dress in in the works. It came off very well, and yes, she is smiling. can i be one of your (too old to be actually possible but fabulously dressed) daughters? lol! Of course! Although you do a pretty good job yourself! I loved your Italian dress with the piping. Simply stunning, too. I’m so impressed that you drafted this yourself. Incredible! A stripey, bias cut dress, yes, a stripey, bias cut version of this?? No. It would drive me mad with the stripes and the definite inability to line them all up properly!! :s It’s almost finished, watch this space! Previous Previous post: Lack of planning….